Titanic II is a proposed ocean liner, to be built as a modern-day replica of the Olympic-class RMS Titanic. The new ship will have a gross tonnage of 56,000 while the original ship measured about 46,000 gross register tons (GRT). The project was announced by Australian billionaire Clive Palmer in April 2012, as the flagship of a proposed cruise company Blue Star Line Pty. Ltd. of Brisbane, Australia. 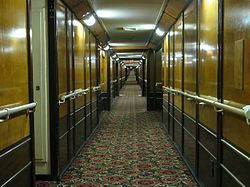 The intended launch date was originally set in 2016, with the ship sailing from Southampton to New York within the same year. In 2015 the planned date for launching the ship was delayed until 2018. As of May 2016, construction had not begun on the vessel. The concept of the titanic has been explored several times to no avail. Expert fear Clive Palmer's dream and vision will not materialize. With an estimated cost of $500 million, things could easily go wrong. Just as predicted by the experts, in June 2013, it was reported that Clive Palmer may be experiencing financial difficulties, and that his two most prominent businesses were running at a loss. This followed the leaking of a letter where he asked a Chinese business partner for a $200 million AUD payment. His net worth was believed to have fallen by $1.6 billion AUD ($1.17 billion US) in 2013. When the project was first announced in 2012, Palmer claimed that construction would begin before the end of the year, with a 2016 launch. Following the launch events in 2013, he then claimed that construction would begin 'within a few weeks', with launch and maiden voyage still listed as 2016. In an August 2013 interview, Palmer however indicated that construction would not begin until March 2014, while still citing 2016 as the intended completion date. It was later claimed that the first cutting of steel would take place in late 2014, with launch delayed by two years to 2018. It was reported in late March 2014 that the project was unlikely to go ahead, and that the Chinese 'had lost interest in the project'. CSC Jinling responded by saying that it would be "difficult for us to build the Titanic II but we have confidence to build it". Blue Star Line reiterated claims that the keel would be laid in Q3 2014. As of July 2016 there was no signed contract with any shipyard and Deltamarin had referred all questions regarding the project status to the Blue Star Line. Maine was anchored in Havana Harbor to protect U.S interests while Cubans revolted against Spanish rule. With the night came the horror. The ship exploded and sank which killed 261 of the 355 crew members on board. Subsequent years brought more tension between the two countries and so were their diplomatic tides. Following the resignation of Fidel Castro due to ill health at the age of 81, his brother Raul Castro assumed presidential responsibilities in 2006 and formally succeeded him in 2008. Early in his presidency Raul Castro appeared to signal an end to hostilities with America calling better relations mutually advantageous. “Today the United States of America is changing its relationship with the people of Cuba” as said by President Obama and this open a new relation between the two countries. Years down the line and this new relations has even grown stronger. Headlining major news media outlets across both counties was a cruise ship that was set to sail from Miami to Havana. The Bermuda-flagged Adonia sailed from the port of Miami carrying some 700 passengers. According Carnival, the Adonia will cruise every other week from Miami to Cuba, with promises to engage passengers "in an ongoing cultural exchange program that gives you the opportunity to interact with the Cuban people." hijacking, an incident during which merchant mariner Captain Richard Phillips was taken hostage by pirates in the Indian Ocean led by Abduwali Muse. Captain Philips was nominated for 4 Golden Globes, 9 BAFTA Awards and 6 Academy Awards. Strong numbers if you ask me but to make it even better, MMNC has on display one of the float rings aboard the Maersk Alabama. It also has a replica of the ship itself on display. 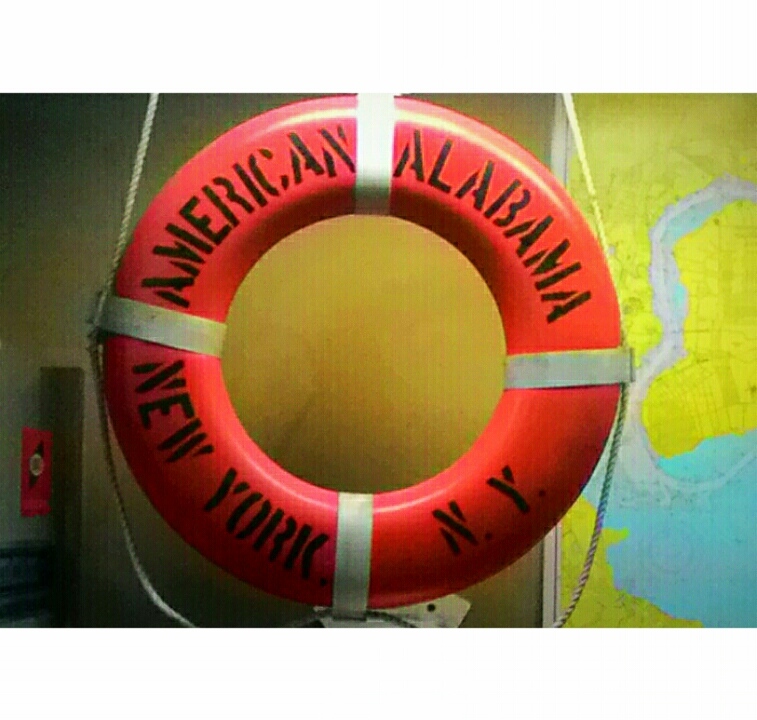 The float ring was manufactured on March 18, 1985 model G.30 size 30”. We currently have a lot of maritime equipment on display Stop by! Sailors navigating the open seas made use of several techniques to determine their location, including staying in sight of land and understanding of the winds and their tendencies. Obviously the navigational practices centuries ago differ vastly from what we do have now but the technical know how even then was key. Navigation can simply be described as the art of getting from one place to another, safely and efficiently. Navigators then did not have charts but instead used lists of directions. 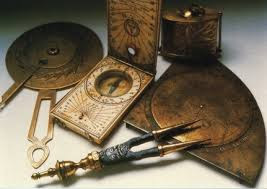 When they did venture out of sight of land, they able to determine their latitude (north/south direction) by observing the height of the sun during the day and the North Star at night. During the mid-thirteenth century, mariners began realizing that maps could be helpful and began keeping detailed records of their voyages. 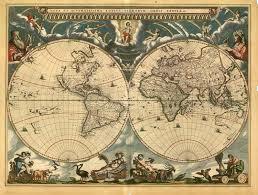 This is how the first nautical charts were created. These first charts were far from accurate, but were considered valuable and often kept secret from other mariners. There was no latitude or longitude labeled on the charts, but between major ports there was a compass rose indicating the direction to travel. A sextant is a measuring instrument generally used to measure the angle of elevation of a celestial object above the horizon. Making this measurement is known as sighting the object, shooting the object or taking a sight. The angle, and the time when it was measured, can be used to calculate a position line on a nautical or aeronautical chart. A common use of the sextant is to sight the sun at noon to find one's latitude. Held horizontally, the sextant can be used to measure the angle between any two objects, such as between two lighthouses, which will, similarly, allow for calculation of a line of position on a char. Once upon a time, the building and repairing done to sea vessels had been the most important industry growing on Staten Island prior to the First World War. The Rutan brothers, William and James had owned the earliest known company that had a significance to our history. This shipyard alone had produced over 100 schooners and sloops a year. In the 1880 approximately 17 shipyards were present on Staten Island mostly alone the north shore. Later in the 1800s the Navy and international shipping of goods raised demands for large shipyards, which formed around mariners harbor and port Richmond. By the 1920s, the now 18 shipyards had employed over 6,000 people. 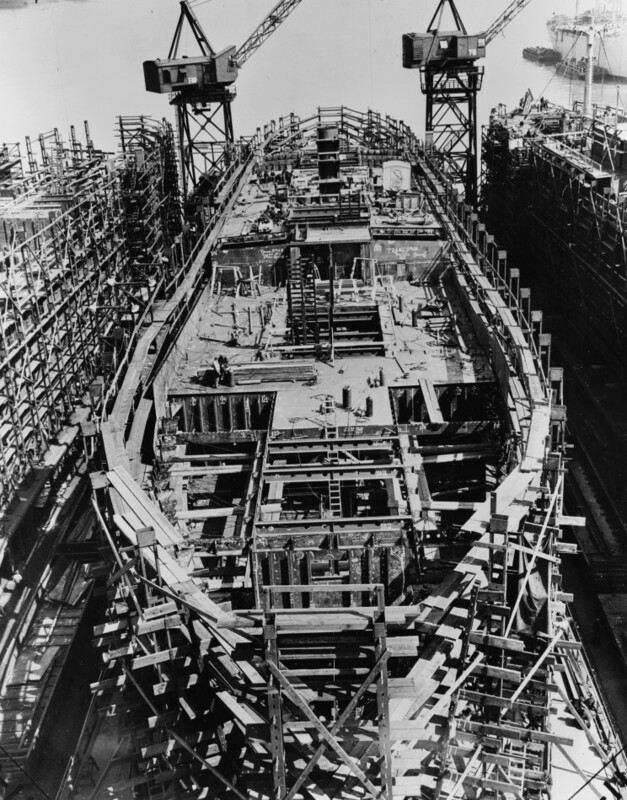 The first company to take dock in Staten Island was Burlee Dry Dock. Originally known as McWilliams repair, the owner was William Burlee. He had been a superintendent for McWilliams Repair in Jersey City. When McWilliams retired, Burlee took over in 1895. In 1898 Burlee took over a neighboring company known as Port Richmond Iron Works, this started the building of engines and steel vessels along with the original wooden. Port Richmond Iron works was founded three years earlier and started as a machine shop. Five years later Burlee moved to expand in what is Mariners’ Harbor, two years later renaming the now large company Staten Island Shipbuilding. 1916 began the building a steel ships when a foundry had been available on the yard. In 1929 SISB merged with five other yards finally becoming United Dry Docks later finalizing as United Shipyards. The company built a range of ships and between the different yards they had they were able to expand and divvy the work evenly. The yard in Brooklyn, Formerly Theodore A. Crane’s Sons, focused on barges and small ships. Mariners Harbor yards took care of the bigger ships that were to be built. 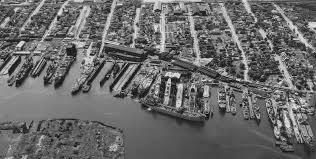 In 1938 Bethlehem Steel company bought United Shipyards using the expansion to aid the now occurring WWII effort. The Navy donated over $5 million dollars to the effort. The company was working on 24-hour periods during the effort. Bethlehem had constructed and launched destroyers to aid in the war. Propellers had also been a strong product made during this time with a foundry on another yard of Bethlehem’s. When the war ended the smaller yards had been shut down and reverted the remaining yards to building tugs and barges, finally closing in 1959. Many Ship Repair currently functions in the Mariners Harbor yard and are currently still building barges.